With the series of posts on alkenes in the can, let’s move on and talk about a closely related functional group that shares many reactions in common with alkenes: acetylenes, or as they are more commonly referred to, “alkynes”. Alkynes, as we shall see, do share many reactions in common with alkenes. However there are some reactions of alkenes which do *not* work for alkynes (dihydroxylation with OsO4 and epoxidation with peroxyacids to give two examples), and conversely several reactions which only apply to alkynes and not to alkenes. Today we’ll introduce two reactions that are of key importance for alkynes – and don’t have a corollary in alkene chemistry (as far as we’re concerned, anyway). Let’s start with an important fact. Alkynes are unusually acidic hydrocarbons. Recall that the acidity of a compound is related to the stability of the conjugate base. In an alkyne, where the carbon is sp hybridized, the lone pair resides in an orbital with 50% s character [the 2s orbital is closer to the positively-charged nucleus than the 2p orbital, increasing stability]. Compare that to alkenes (sp2, 33% s-character) and alkanes (sp3, 25% s character) and we have an explanation as to why alkynes have a pKa of 25, which is a factor of 1017 more acidic than your typical alkene (pKa about 42) and 1025 more acidic than alkanes (pKa 50). This means that alkynes can be deprotonated without resorting to heavy artillery (i.e. organolithium bases, or Schlösser’s base – not that you probably need to know about that particular reagent) required to deprotonate alkenes. Instead, readily available sodium amide (NaNH2) the conjugate base of ammonia (pKa 38) can be used, which is a big plus for convenience. So that’s certainly one way in which the chemistry of alkynes is distinct from that of alkenes: alkynes can be readily deprotonated. Knowing that, care to take a guess what the next extension of this is? You might recall that in all cases that the conjugate base is a stronger nucleophile. And almost every reaction in organic chemistry involves the attack of a nucleophile upon an electrophile. So one logical application of being able to deprotonate alkynes into acetylide ions is that they are excellent nucleophiles and we can combine them with various electrophiles. 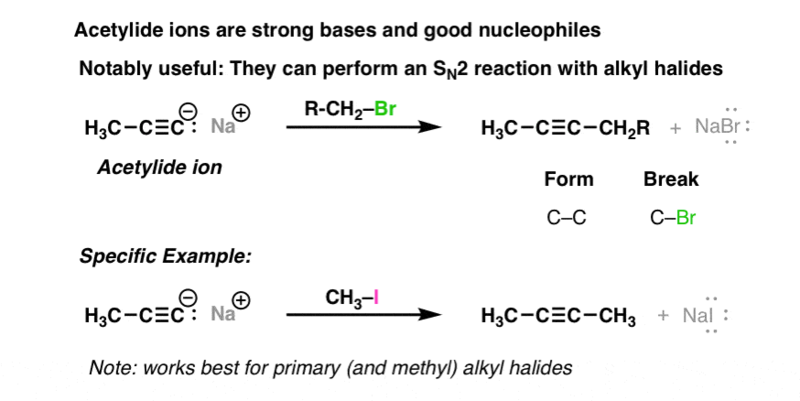 One of the simplest and yet most powerful reactions in terms of generating a diverse array of functional groups is the SN2 reaction, in which a nucleophile attacks a carbon with a good leaving group (alkyl halides or sulfonates). The “big barrier” to the SN2 is steric hindrance so the reaction works particularly well for methyl and primary alkyl halides (secondary alkyl halides are a bit iffy in this context). Here’s an example of how the SN2 can be applied to alkynes. It’s a typical substitution reaction: we’re forming and breaking a bond on the same carbon. Now comes the important part. This SN2 reaction is particularly useful. Why Is This So Important? Because It Forms A New Carbon-Carbon Bond! Notice the type of bond that’s being formed here: we’re forming a carb0n-carbon bond. If you’ve read previous posts leading up to this one, scratch your head for a moment: can you think of any examples where we’re forming a carbon-carbon bond? Probably not! [one example is cyanide ion with an alkyl halide]. Why is this important? Consider that organic chemistry is the study of carbon containing molecules. The reaction of acetylides with alkyl halides, therefore, is a way of extending the carbon skeleton of the molecule. We haven’t yet learned any other reactions that perform this function nearly as well. If you are studying alkynes, it is likely that in the near future you will be asked to solve “synthesis” problems, where you build more complex molecules out of simpler parts. The SN2 reaction of acetylides with alkyl halides often plays a pivotal role, since it allows for the extension of the carbon chain. So pay particular attention to it! In the next post, we’ll talk about some other reactions that are unique to alkynes, and see – once again – how stereochemistry can rear its ugly head. When we react Acetylide Ion with Alkyl Halides, do we also get Elimination (minor) products ?